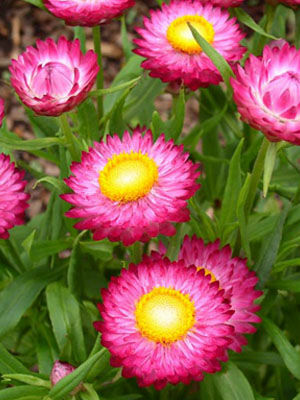 Strawflowers close at night and in rainy weather, so they are at their best in sunny beds seen during the day. Blue ageratum or airy nigella make excellent neighbours for strawflowers. Sow seeds indoors suring winter and set plants out after the last frost has passed. Seedlings are sometimes available as bedding plants.